As new homes, offices, and shops sprout around the region's Metro stations, Forest Glen has remained a holdout due to neighborhood resistance to new construction. But that may change as WMATA seeks someone to build there. Forest Glen today. All photos by the author. Last month, the agency put out a call for development proposals at Forest Glen, in addition to West Hyattsville and Largo Town Center in Prince George's County and Braddock Road in Alexandria. WMATA owns 8 acres at Forest Glen, most of which is a parking lot, and developers have already expressed interest in building there. Forest Glen should be a prime development site. 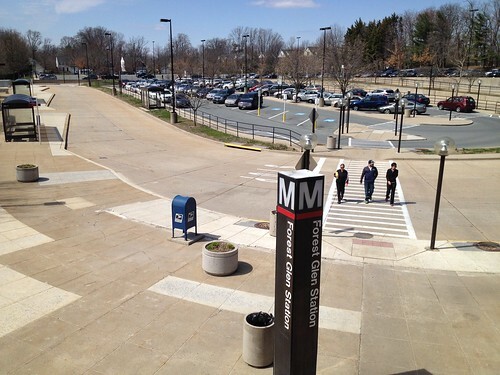 While it's on the busy Red Line, it's one of Metro's least-used stations. It's adjacent to the Capital Beltway and one stop in each direction from Silver Spring's and Wheaton's booming downtowns. Holy Cross Hospital, one of Montgomery County's largest employers with over 2,900 workers, is a few blocks away. But since Forest Glen opened in 1990, not much has happened. On one side of the Metro station is a townhouse development that's about 10 years old, while across the street are 7 new single-family homes. The land the parking lot sits on is valuable, and it's likely that WMATA will get proposals to build apartments there because the land is so valuable. But zoning only allows single-family homes there, the result of a 1996 plan from Montgomery County that recommends preserving the area's "single-family character," due to neighbor concerns about traffic. Townhouses next to the Forest Glen parking lot. As a result, whoever tries to build at Forest Glen will have to get a rezoning, which neighbors will certainly fight. It's true that there's a lot of traffic in Forest Glen: the Beltway is one block away, while the adjacent intersection of Georgia Avenue and Forest Glen Road is one of Montgomery County's busiest. While traffic is always likely to be bad in Forest Glen, though by taking advantage of the Metro station, there are ways to bring more people and amenities to the area without putting more cars on the road. Today, two-thirds of the drivers who park at Forest Glen come from less than two miles away, suggesting that people don't feel safe walking or biking in the area. There's a pedestrian bridge over the Beltway that connects to the Montgomery Hills shopping area, a half-mile away, but residents have also fought for a tunnel under Georgia Avenue so they won't have to cross the 6-lane state highway. Montgomery County transportation officials have explored building a tunnel beneath Georgia, which is estimated to cost up to $17.9 million. But county planners note that a tunnel may not be worth it because there aren't a lot of people to use it. And crossing Georgia Avenue is only a small part of the experience of walking in the larger neighborhood. Today, the sidewalks on Forest Glen Road and Georgia Avenue are narrow and right next to the road, which is both unpleasant and unsafe. WMATA has asked developers applying to build at Forest Glen to propose ways to improve pedestrian access as well, and they may want to start with wider sidewalks with a landscaping buffer to make walking much more attractive. Investing in bike lanes would also be a good idea. Another way to reduce car trips is by providing daily needs within a short walk or bike ride. The Montgomery Hills shopping district, with a grocery store, pharmacy, and other useful shops, is a half-mile away from the Metro. But it may also make sense to put some small-scale retail at the station itself, like a dry cleaner, coffeeshop or convenience store, which will mainly draw people from the Metro station and areas within walking or biking distance. Some people will drive, but not as many as there would be with larger stores. Putting shops at the Metro might also encourage workers at Holy Cross to take transit instead of driving, since they'll be able to run errands on their way to and from work. Encouraging this crowd to take transit is important, since hospitals are busy all day and all week, meaning they generate a lot of demand for transit, making it practical to run more buses and trains, which is great for everyone else. Whatever gets built at the Metro will have to include parking, not only for commuters, but for residents as well. While Montgomery County's new zoning code requires fewer parking spaces, each apartment still has to have at least one parking space. Even small shops will have to have their own parking. The more parking there is, the more likely residents are to bring cars, which of course means more traffic. Thus, the key is to give future residents and customers incentives to not drive. The new zoning code does allow developers to "unbundle" parking spaces from apartments and sell or rent them separately. Those who choose not to bring cars will then get to pay less for housing. The code also requires carsharing spaces in new apartment buildings, so residents will still have access to a car even if they don't have their own. If Montgomery County ever decides to expand Capital Bikeshare, the developer could pay for a station here. And the developer could offer some sort of discount or incentive for Holy Cross employees to live there, allowing hospital workers to live a short walk from their jobs. No matter the approach, there are a lot of ways to build in Forest Glen without creating additional traffic. A creative approach can do wonders for the area's profile and elevate the quality of life for residents there. I really don't agree with you on this. We need to space out urban dense zones. Forest Glen is a respite between Silver Spring and Wheaton and you would probably harm the development of Wheaton if you allow too much development at Forest Glen. One thing you don't address is that the state does not allow left turns off of Georgia Avenue onto Forest Glen Road into the station. So some people do u turns on Georgia, which is not very safe. Certainly you could not consider development without building the tunnel underneath Georgia, which also would serve visitors and employees at Holy Cross Hospital. An office building might make sense on the site if we weren't face a glut of commercial office space. Retail stores would attract more drivers than walkers. A pedestrian tunnel and redesign of the Georgia Avenue - Forest Glen Road intersection to create dedicated left turn lanes and a dedicated right turn lane from northbound Georgia to eastbound Forest Glen Road should be required to be complete before any development of the Forest Glen parking lot, etc., is permitted. At the very least WMATA and the developers -- the only people who would benefit from developing the parking lot area -- should be required to pay for the intersection improvements and the tunnel. As a resident of Forest Glen, I would love a small amount of local retail at the station, which would make my neighborhood much more walkable. I also believe a tunnel under Gerorgia Ave. would get a lot more use than planners may expect, especially if it were large enough for two-way bicycle traffic. Such a tunnel should be part of bike connector route between the popular Sligo Creek and Rock Creek trails along Forest Glen road. In this way development could happen without major gains in car traffic as more people take bicycles to the station. As another resident of Forest Glen, I also would love love love to see a small amount of sensible retail at the Forest Glen station. And I'm willing to accept the increased housing density necessary to justify it. A quality residential building on the existing asphalt surface parking lot, including a couple small retail stores (dry cleaning, a beer & wine & sundries market), would be fantastic. The WMATA lot at issue is only 8 acres. There's not nearly enough room for anything that could compete with development in Silver Spring or Wheaton. 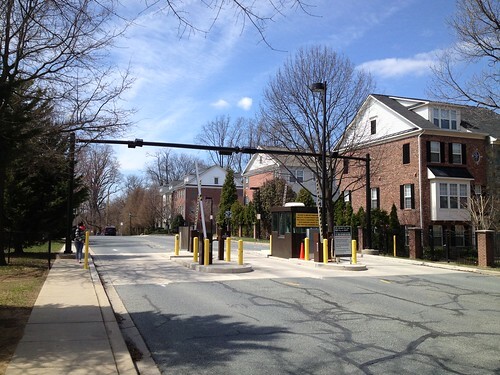 Forest Glen will remain a respite between SS and Wheaton after the small WMATA surface lot is developed. Re: left turn lanes on Georgia at Forest Glen, those are discussed in the comments on the GGW site where this article was cross-posted. The State Highway Administration is currently developing alternatives for improving Georgia's streetscape between Forest Glen and 16th St. All of the proposed alternatives include creating space for left-turn lanes from Georgia at Forest Glen, plus buffered sidewalks and a pedestrian refuge median in the middle of Georgia. These improvements are in the works, but full funding and construction are years away. Perhaps a developer will be required to contribute/fund these improvements. The WMATA request for bids requires pedestrian improvements, so I'm encouraged. The new northeast Metro entrance ("tunnel" as it's often called; in fact it's a standard Metro station entrance on the northeast corner of the intersection) also is well along in planning and engineering. It just needs funding. Hopefully a developer will contribute funds, and/or the state/county/WMATA will dedicate funding to leverage this development. Waiting for these infrastructre improvements before allowing development would be silly, especially if they can be leveraged in conjunction with development. I'm always suspicious of arguments to the effect that development should wait for this or that infrastructure improvement. It seems doubtful that those making this argument would ever agree that the time is right for sensible development. There is not room enough on the site for the amount of retail that would attract enough auto traffic to make a difference. At most we're talking about a couple small stores hoping to serve Metro users and immediate neighbors. There wouldn't likely be room for much if any parking for access to the retail. Anyone already in their car looking for retail very likely would continue driving 1/2 mile south on Georgia to the big mostly-empty parking lots at the CVS/Staples strip mall and the other retail options in Montgomery Hills, just across the beltway from the Forest Glen Metro station. In fact, a bit of retail at the Forest Glen station would *improve* vehicle traffic in the area. The many, many existing Forest Glen residents currently have to drive on Georgia under the beltway to get to the existing retail options at Montgomery Hills, which are subpar at best. The horrendously ugly CVS/Staples strip mall and its big, mostly-empty surface parking lot would lose a lot of business from neighbors in Forest Glen, if Forest Glen residents were able to grab their dry cleaning and a bottle of wine at the Metro station on their way home. No longer would a whole lot of people have to get in their cars after walking home from Metro, then drive less than a mile to traffic-choked Montgomery Hills's subpar retail options. I look forward to development of the Forest Glen station's surface parking lots, if it involves some ground floor retail and is leveraged to fund the planned new Metro entrance and streetscape/pedestrian improvements at Forest Glen and Georgia Ave. This would benefit all area residents. Kati - I agree with the small amount of retail would do well there, although it would be interesting to see what it would be. This is an admittedly NIMBY neighborhood, so good luck getting a Montgomery County alcohol permit in there for those bottles of wine! The main reason the tunnel is projected to be underused is the current state of the intersection. MCDOT repaved Forest Glen Road btwn Georgia and Sligo Creek, and made it more dangerous for bicycles, not less so, and there's only a sidewalk on the side of Forest Glen opposite where the tunnel under Georgia would begin. The construction of this development would also be a disaster, because, unlike Wheaton, there is no alternate dropoff place/kiss and ride area. I really think they should finish the tunnel first, and then use the Medical Office Building as a Kiss and Ride during construction. I think of Forest Glen like a parched desert in between Wheaton and Silver Spring. A place with nothing to walk to is miserable for me and I don't understand why so many people are okay living there. They don't know what they're missing by not being able to walk to a restaurant or grocery store. And don't get me started on people who drive less than a mile to get to the metro station. We left Forest Glen when we bought our house in Wheaton. Walkability was a big factor in not trying to stay in Forest Glen. Snyders is great, as is the Tropical Ice Cream shop along with the dry cleaners nearby. But they all required a long walk down Seminary if we weren't willing to go via the Georgia Ave route. Good luck Forest Glen. Driving to the destinations, seemed silly and was quite a headache during rush hours. The "tunnel" from Metro to the Northeast corner of the Georgia-Forest Glen intersection is a no-brainer because most of Metro's passengers come from North of Forest Glen. However, HC Hospital has to be served, which means extending a buffered walkway on the North side of Forest Glen all the way to Dameron. That likely will be even more expensive than the tunnel itself. But with the tunnel, all cross-Georgia foot traffic could be forced underground, permitting a lot more auto turn traffic at the intersection. The Medical Center is now the cause of much traffic difficulty, with cars trying to beth enter and leave from the small Forest Glen entrance. I wonder if the planners are looking at taking part of the Medical Center land for a kiss-and-ride lane and much more efficient access to the Medical Center? - safer sidewalks along Georgia, set back further from the road. - some trees along Georgia. We need noise buffers and air cleaners along that crazy highway. - a deli that sells basics on a small scale as well as stuff you can grab and go with in the morning for work. - let's also add a community garden to that list. There seems to be plenty of land on Kimball by that blue colonial. Guerrilla gardening anyone... an--anyone? Some very interesting comments and ideas. I used to live in an apartment in Downtown Silver Spring - for 7 years - and loved being able to walk to the metro. I then moved to South Four Corners and for awhile took the Rt 8 RideOn. After having a child, I started driving to the metro for ONE reason. SCHEDULE. The RideOn bus runs every 30 minutes. If I drop my son off at his local in-home daycare when it opens, I can't catch a bus until 8:30. That makes me late for work. If I walk, the bus passes me about a block from the metro. If I drive to the metro I get there 20 minutes earlier and get to work on time. I know many of the families in my neighborhood have expressed the same sentiment. I think it is dumb to drive a mile and pay $5 a day to park. However, I need to be on time to work. Having more frequent public transportation options would be a great way to decrease traffic and decrease the demand for the parking lot. And then, to be quite honest, I might be excited about some bodega, dry cleaning, Starbucks options suggested here.